I was searching the forums and didn't see anything on this company iFairings.com and would like feedback from you regarding this company. I want to change the look of my 899 and did a Google search for new fairings. I came across these https://www.ifairings.com/motorcycle...mited-edition/ and wanted to know if anyone else has used them before. If not can anyone recommend a brand that is bolt on? I'm not expecting OEM Ducati quality and even a few fitment issues in all honesty. I am also looking at ProBolt USA for some hardware if anyone has any experience with them as well. I ordered the exact same set from ifairings.com and received notification today that they've shipped. Will let you know how they look when they arrive in a week or 2. I looked at several different options before ordering but couldn't find much information on the company's products or unbiased reviews. I went with ifairings mainly because someone called Mike followed up by email and was responsive and even questioned if I ordered the right set. I hadn't. I meant to order the traditional Italian flag colors but ordered the one with black stripes instead. He corrected that for me. Thanks for reaching out to iFairings.com. 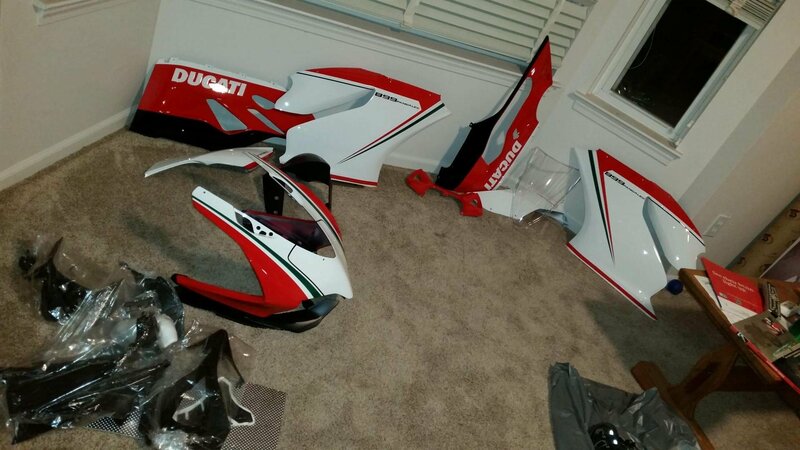 If you order the fairing kit today, you will receive it in three weeks. Thanks again for contacting us and look forward to getting your business. I am looking forward to your review of the set you receive in terms of quality and if you had to seriously modify them to fit. Do you think you could post some pictures as well? If your set is good to go I will order the set I want. Thank you big time for taking the leap and helping me make my decision!!!! My ifairings arrived in a very large box today, 14 days after I confirmed the order. In short, they are about what I expected for $500. Nice glossy finish, but some imperfections in the paint if you look for them. Obviously not painted in a clean room. The nose fairing is a bit misshapen. Shouldn't be an issue once installed on the bike. I'll do that this weekend. The decal installer had the shakes this day... 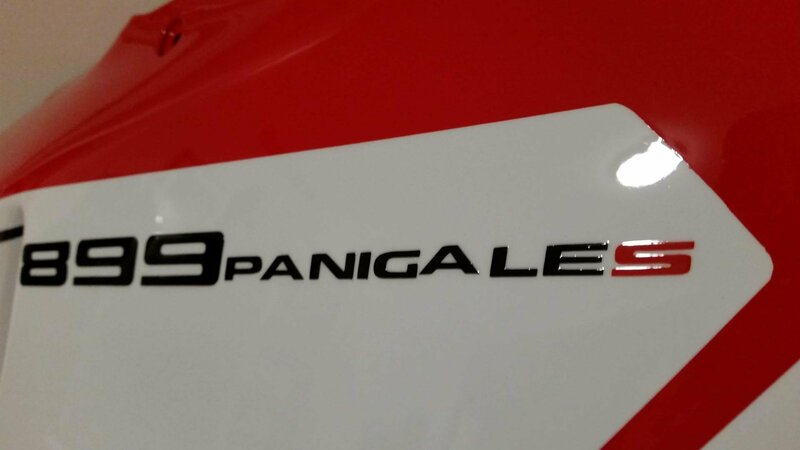 The A in the Panigale is raised 1/8". Weirdly, it's the same on both sides. I will reserve final judgment until I get them fitted, but there's nothing here that would cause me to box them up and send back to China for refund. Thank you very much for the posting pictures. 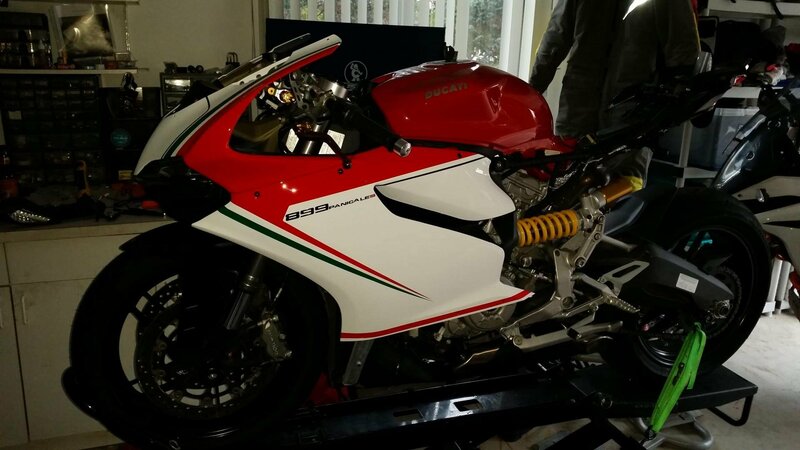 I can't wait to see how the installation turns out and if that nose fairing will be an issue. I guess the decal guy was on his Friday shift for the A to be that off, unless they did intentionally for some reason or another. Anyway thank you again and can't wait to see how it all installs for you. Well, so far, I'm not having much fun with this install. Took me probably 2 hrs to get the nose fairing on the bike, no joke. Granted, I've never put this exact piece on this bike, but holy crap that was fiddly. I managed to snap a few small tangs off the piece that wedges under the headlight assembly. But the worst part was getting the bolts through the fairing stay and into the fairing tab behind. I consider myself to be pretty handy with tools, but I felt like I had 5 thumbs today. If you order this kit and don't already have all the fasteners, plan to source those yourself. The freebies they send in the box are generic hardware nuts and bolts. Completely useless. I just chucked them right into my nuts and bolts tray. Also, the red isn't a great color match for the tank. 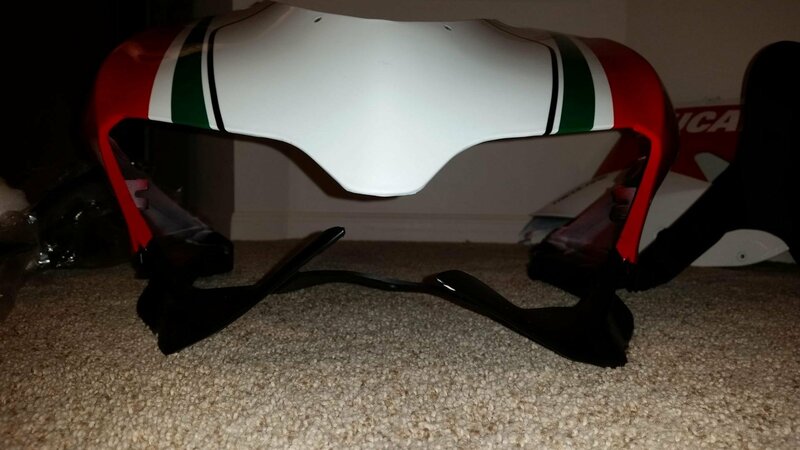 Little hard to see in the photo, but the fairings are a lighter shade of red. More to come, but I may have to order more bolts to complete the job. Thank you for the picture and the installation snafu's you had. I have had the nose piece off 3 times since owning my 899 so I can do it easily now, but what you went through is crazy. I think I am going to pass on this full set from this company. My OCD would kill me with the quality and what you went through to put it all together. I had the preconception that for $500 it would need to be fiddled with but not at the degree you went through. This would make a nice track set but that's not what I'm doing with the bike. So you bolted everything up already? How are you going to reach the bottom screws to attach the windscreen? I am going to get all my hardware from Pro Bolt USA and they have a great track record of reviews. 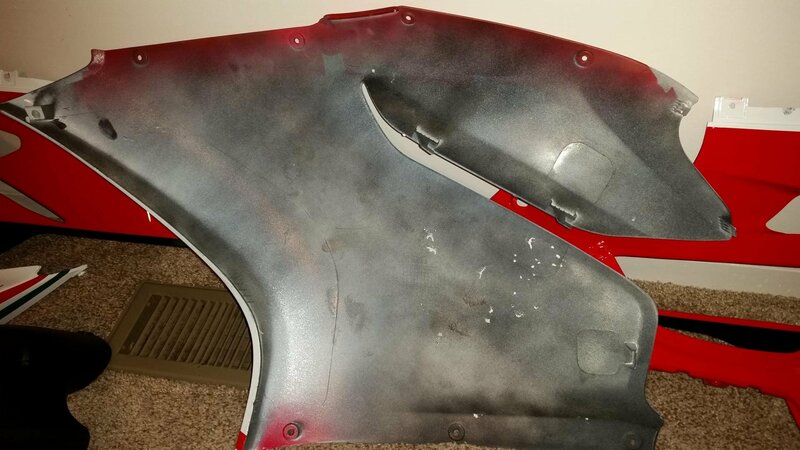 I am either going to keep the bike the same in the OE fairings or go this route with Carbon Fiber https://www.motocomposites.com/produ...bon-parts.html. In any event THANK YOU so much for your honest review I sincerely appreciate it!